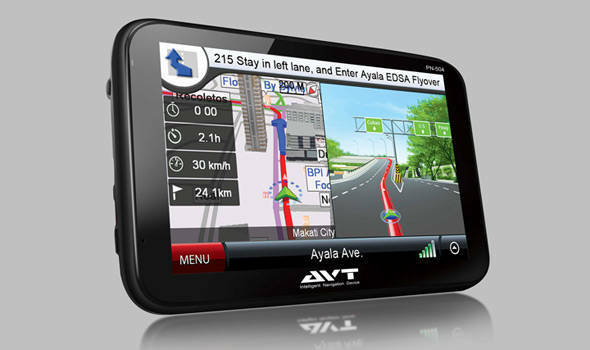 AVT, the Philippine company that pioneered GPS vehicle navigation and multimedia devices, will be showing off its new products at the upcoming Philippine International Motor Show to be held on August 16 to 19, 2012, at the World Trade Center in Pasay City. To be launched at the biennial event is the latest model of AVT's personal navigation range, the PN-504. Featuring a new, high-resolution five-inch LCD touch screen, the PN-504 utilizes the latest Atlas IV 533MHz CPU and has a built-in, high-sensitivity GPS receiver that can quickly acquire its position in three minutes. It also serves as a multimedia player capable of accessing different media formats (like MP3, MP4 and WMV, for starters), and a photo viewer. Other extra features include a calculator, a calendar and a unit converter. Powering the PN-504's GPS capabilities is the pre-loaded Philippine map exclusively developed by iNAV. Unique to the AVT personal navigator range are its improved turn-by-turn navigation that comes with junction lane assist to give the user an enlarged view of where he/she needs to be to make a turn; 3D junction view to give the user a 3D guide as to which lane to take; 3D buildings to provide the user with landmarks for better location identification; and speed camera sensor to warn the user of speed camera locations and avoid speed violations. Like AVT's other personal navigator devices, the PN-504 comes with free map updates for two years, giving the user access to maps with the latest changes to the country's road network. Visitors to AVT's PIMS booth might also want to check the iStar, a portable tracking device that works on the GSM/GPRS networks and GPS satellites. According to AVT, the iStar can be used to track and monitor your vehicle, and it has a built-in microphone so you can listen in to conversations and sounds inside the subject vehicle. Keeping track of the vehicle's location can be done either through SMS or via web apps. The iStar also has an SOS/emergency alert, low-battery alert, geo-fencing, and mileage report features. At PIMS, AVT will offer very special prices on its products, including a "trade-in" promo for old navigation devices of any brand, hefty discounts on custom multimedia systems, and zero-percent interest on items bought through installment terms.